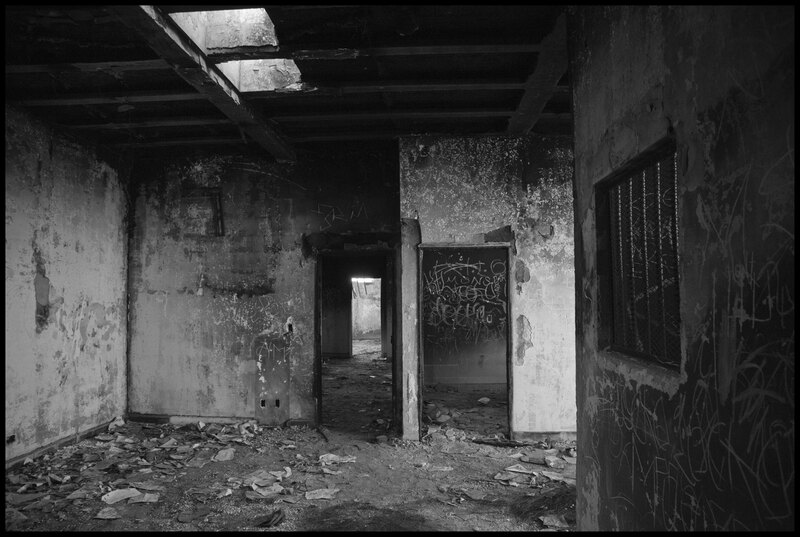 A burned-out concrete blockhouse—the former police station—squats on one side of the only divided street in Vicente Guerrero, half a mile from Baja California’s transpeninsular highway. Just across the street lies the barrio of Nuevo (New) San Juan Copala, one of the first settlements of migrant farm workers here in the San Quintín Valley, named after their hometown in Oaxaca. Behind the charred stationhouse another road leads into the desert, to a newer barrio, Lomas de San Ramón. Here, on May 9, the cops descended in force, allegedly because a group of strikers were blocking a gate at a local farm. A brutal branch of the Mexican police did more than lift the blockade, though. Shooting rubber bullets at people fleeing down the dirt streets, they stormed into homes and beat residents. By then a farm-labor strike here was already two months old. 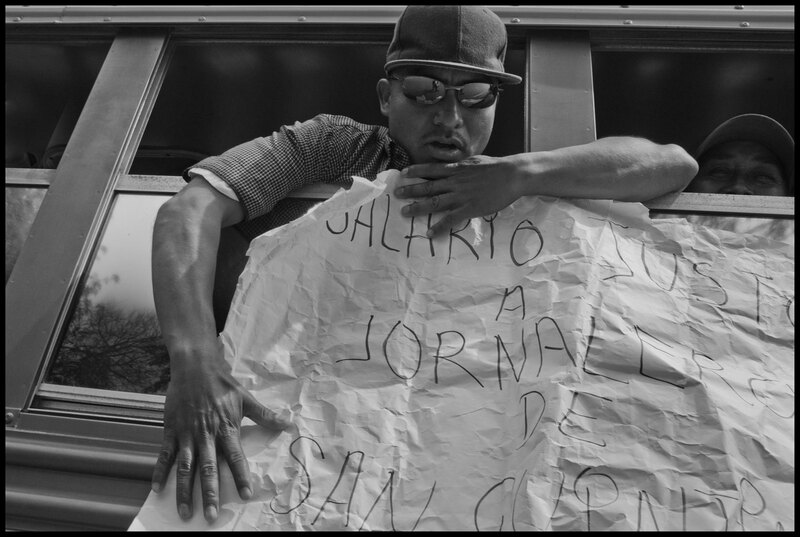 Some leaders say provocateurs threw rocks and egged on a confrontation, but the beatings undeniably set off smoldering rage in the Lomas and Copala barrios. In addition, a government official who’d agreed to negotiate had failed to show up to talk with strike leaders. By the end of the day, the police headquarters was a burned-out shell. One of the armored pickup trucks (called tiburones, or sharks) driven by police at breakneck speed down the dusty alleyways had been torched as well. It would be hard to imagine a more dramatic demonstration of workers’ fury over four decades of hunger wages. And while the most dramatic protest this year has taken place in Baja California, the same anger is building among indigenous farm workers all along the Pacific Coast, from San Quintín in Mexico to Burlington, an hour south of the US border with Canada. Two years ago Triqui and Mixtec workers struck strawberry fields in Skagit County in Washington State. 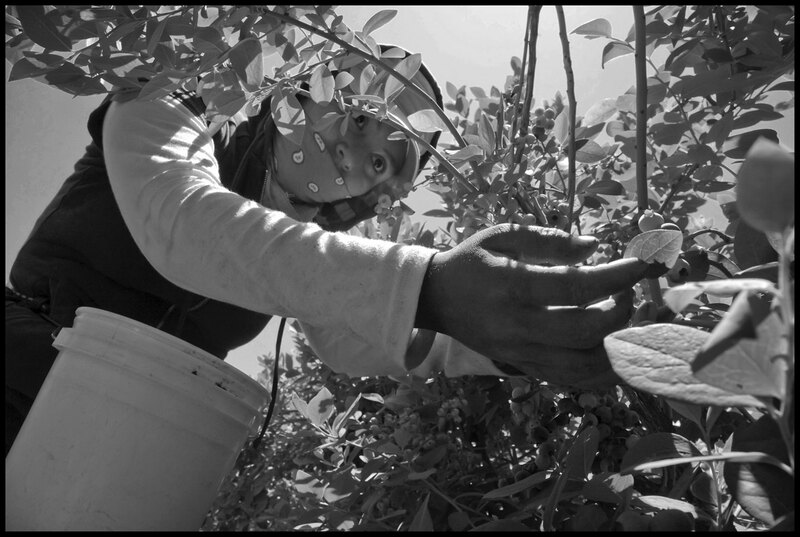 Two years before that, Triqui workers picking peas in the Salinas Valley rebelled against an inhuman work quota, and immigration raids in the town of Greenfield. The strawberries, blackberries, and blueberries sold everyday in US supermarkets are largely picked by these indigenous families. Their communities are very closely connected, all along the agricultural valleys that line the Pacific Coast. These migrants come from the same region of southern Mexico, often from the same towns. They speak the same languages—ones that were thousands of years old when Europeans first landed on this continent. Increasingly they talk back and forth across the border, sharing tactics and developing a common strategy. Indigenous farm workers labor for a small number of large growers and distributors who dominate the market. One of the largest distributors is Driscoll’s. Miles Reiter, retired CEO and grandson of its founder, says its intention is “to become the world’s berry company.” Driscoll’s contracts with growers in at least five countries, and even exports berries from Mexico to China. Driscoll’s and its Baja partners BerryMex and MoraMex have a large share of Mexico’s $550 million annual berry harvest. Last year Mexico shipped 25 million flats of strawberries to the US Mexican shipments of 17 million flats of raspberries and 22 million flats of blackberries were larger than US domestic production. The company, with headquarters in Watsonville, California, is a partner with growers all along the US Pacific Coast as well. Global distributors and growers wield enormous economic and political power. But farm workers are beginning to challenge them, organizing independent and militant movements on both sides of the border. One of the San Quintín strikers, Claudia Reyes (her name, and those of her family members, have been changed to protect them from retaliation), walked out when the movement started. She works in the huge tomato greenhouses of Rancho Los Pinos, owned by the Rodriguez family, one of the most politically powerful in Baja California. The gulf between her living conditions and the wealth of the grower she works for is typical of indigenous farm-worker families in the valley. 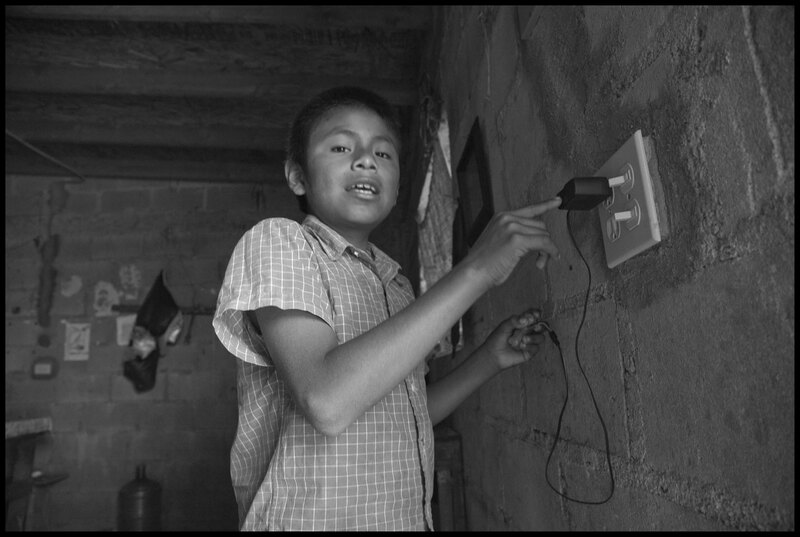 Reyes’s home in Santa Maria de Los Pinos is a cinderblock house with a concrete floor, an amenity many neighbors lack. Several years after building it she still can’t come up with the money to buy frames and glass panes for windows. She’s also strung electrical conduit and plugs up the concrete walls, but the government provides no electrical service. “We buy candles for light at night, and I worry that some crazy person might break in and hurt me or the kids, because there are no streetlights either,” she says. During the six-month work season her family doesn’t go hungry, but they eat meat only twice a week because a kilo costs 140 pesos (about $8). Eggs cost 60 pesos ($4) a carton, she says, “so it takes half a day’s work just to buy one.” She’s paid by the hour, making 900 pesos a week, or 150/day ($9), for the normal six-day week. All along her dirt street neighbors have strung up long pieces of thin cloth to keep out the omnipresent dust. There’s no sewer service, and although there is a water line, the water is almost unusable. Since the mid-1970s big growers and their US partners have pumped so much water from the desert aquifer that salt has infiltrated the groundwater. The largest growers are now building desalination plants and installing drip-irrigation systems in huge greenhouse complexes. 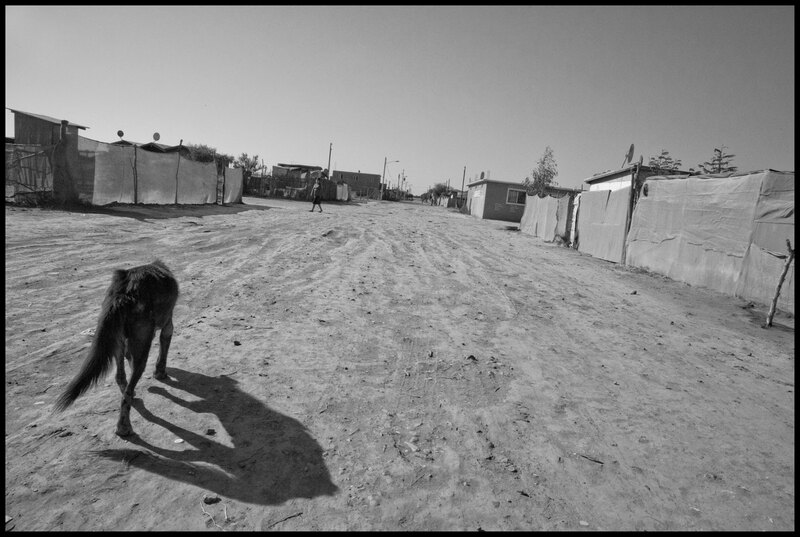 In the barrios, however, families live with salty water. “It makes the children sick,” Reyes says, “and gives them a rash if they wash with it.” At the entrance to her yard sit two 55-gallon drums. Every few days a big tank truck fills them with drinking water—for a price. It was water that led to the creation of the organization that mounted this spring’s strike. Two years ago community committees in the valley towns formed the Alianza—the Alliance of National, State and Municipal Organizations for Social Justice—to fight for better water. They won promises from the government of extended service hours and improved quality. Women charge that supervisors harass them. According to Reyes, “They don’t say anything. They just go with the foreman, but they do it against their will, out of fear.” She named several supervisors at large companies she says have hit on women. All the companies say they have policies forbidding sexual harassment, but firings for violations are virtually unheard of. BerryMex, the largest employer of strawberry pickers in the San Quintín Valley, says it pays much more. A posting on the company website during the strike claimed workers earned $5–9 per hour—a top wage equal to California’s minimum wage of $9. Pickers are usually paid a piece rate, however, both in Mexico and the United States. Earnings vary greatly depending on the time of year, the condition of the field, and how fast they work. In an interview, BerryMex CEO Garland Reiter mentioned one worker who made 2800 pesos a week ($185), but acknowledged the average was probably less. “But we also pay the employee’s contribution [for government-required social benefits],” he said. “When the employee gets 180 pesos a day we’re actually paying 220.” BerryMex’s piece rate is 14 pesos a box (the Alianza wanted 20). Reiter said lower wages in Mexico wasn’t the main reason for developing its San Quintín operation. “We wanted to compete with Chile, using trucks to get to the US market in the winter instead of air freight,” he said. The company invested in erecting cloth tunnels over its berry rows, a desalination facility, a clinic, and measures that doubled worker productivity. In a final negotiation session between the Alianza and the government on June 4, authorities announced a new minimum wage in San Quintín of 150, 165 or 180 pesos a day, depending on the size of the employer. They also warned they would enforce the collection of employer contributions for social security, housing and other benefits. But the price of a gallon of milk in a Baja grocery store is nearly the same as in San Diego. At a minimum hourly wage in a California field, that takes about 25 minutes to earn. A Baja piece rate worker in a good field might make it in an hour or two. At the top daily wage of 180 pesos, it takes almost 3 hours. At Reyes’s wage, it takes even more time. The picking season is only six months long, so workers have to survive during the months when there’s no work. San Quintín’s Mixtec and Triqui laborers originally came as yearly migrants, returning to Oaxaca after picking ended. Today, however, most live in the valley permanently. 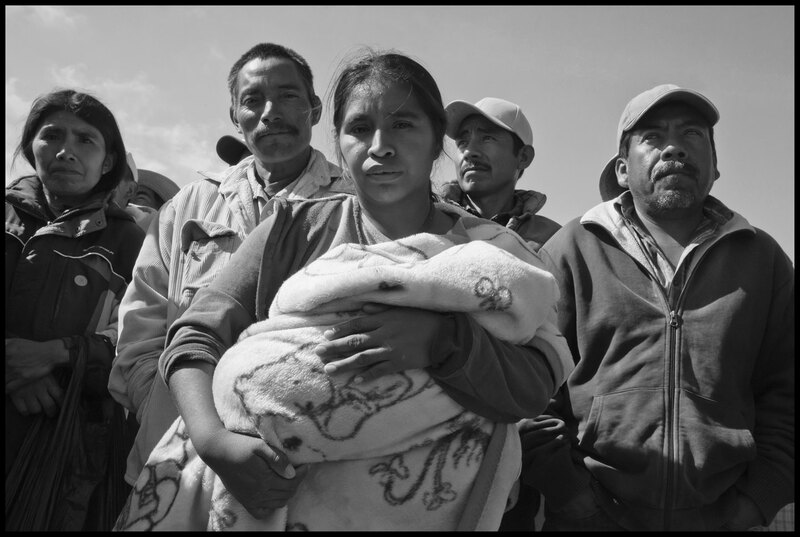 BerryMex’s labor camp houses 550 temporary migrants, but the rest of its 4,000–5,000 pickers live in the towns along the highway. The Mexican government subsidizes some living costs in the off-season, through an income-based subsidy called IMSS-Oportunidades (recently renamed IMSS-Prospera). But most families have to get what work they can or borrow from friends. Families also survive through money sent home by relatives who work in the United States. A recent study estimates that over 12 percent of San Quintín’s farm-worker families now have at least one member living there. In economic terms, the strike was fought to a draw. Workers originally demanded 300 pesos a day, and then lowered it to 200 pesos. The government gave even less. Nevertheless, wages and benefits will rise for some. But after negotiations ended, Alianza leaders announced a decision that will have a greater long-range impact, and will bring them into much closer alliance with indigenous strawberry workers across the border. To do this, however, the Alianza will have to break the agreements, called protection contracts, that growers have with politically connected and company-friendly unions. These agreements are signed without input from workers, who often have no idea they even belong to such a union. When the strike started, these unions quickly signed new agreements for 15 percent wage increases (less than what the government eventually agreed to), and then told strikers to go back to work. Reyes charges the union in her workplace even paid a bounty of 50 pesos for the names of strikers, which it then turned in to management. Workers, she says, are told that if they don’t join it they’ll be fired. An independent union in Baja California, however, contesting for a contract with Driscoll’s growers, will find allies among workers in Burlington, Washington. 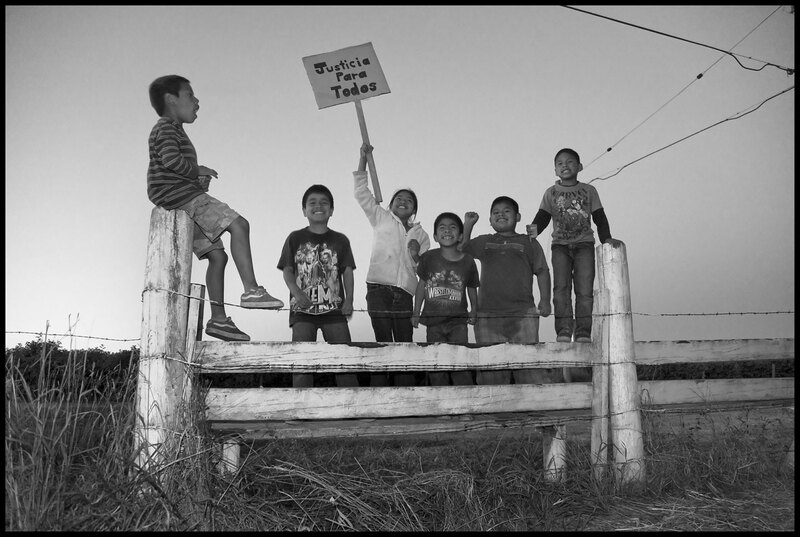 Two years ago several hundred Mixtec and Triqui berry pickers went on strike at one of the state’s largest berry growers, Sakuma Brothers Farms. They then organized an independent union, Familias Unidas por la Justicia (Families United for Justice). Alianza leader Bonifacio Martínez is a friend of Felimon Piñeda, the vice president of FUJ. “We’ve talked a lot with Felimon,” he says. “They’ve been fighting for almost three years, and they’ve formed a union. We’re trying to set up the same thing—a union that will defend our rights. We’re the same workers, and we’re talking about the same kind of union.” They also work indirectly for the same company. Sakuma Farms sells its blueberries to Driscoll’s, which also markets the berries from BerryMex and MoraMex. The workers in Washington State have been organizing pressure on Sakuma Farms and Driscoll’s since they went on strike originally in 2013. That season several hundred workers left the fields repeatedly in disputes over wages, the conditions in the company’s labor camp and the firing of a worker leader. FUJ demanded $14 per hour, and a piece rate set so that workers would make at least that minimum. Managers at first agreed to a process for setting the piece rate. But when it would have set higher wages the company would not implement it. That year Sakuma applied for 160 workers under the H-2A visa program, and eventually brought in about 70. Ryan Sakuma said in an interview at the time, “Everyone at the company will get the H-2A wage for this work.” That was about $12 an hour—a wage mandated by regulations governing the program. According to Rosalinda Guillen, director of Community to Community, an organizing project that’s been the workers’ key source of support, “The H-2A rate limited what was possible. The workers had to accept $12 because that’s what the H-2A workers got.” Some workers said they were earning less—Washington State’s minimum wage of $9.19 an hour. FUJ President Ramon Torres met some guest workers in a local church, away from the labor camp. “They were very afraid. They said that they’d been told that if they talked with us they’d be sent back to Mexico,” he charged. Relations deteriorated, and the company fired Torres over an allegation—later proven false—of domestic abuse. The next spring Sakuma sent strikers form letters saying they’d all been fired. The company applied for certification from the US Department of Labor to bring in 438 H-2A guest workers, enough to replace its previous workforce, saying it couldn’t find local workers. Strikers all signed letters to the DoL saying they were willing to work, and Sakuma eventually had to withdraw its application. According to FUJ, however, most strikers were not rehired in the 2014 season. 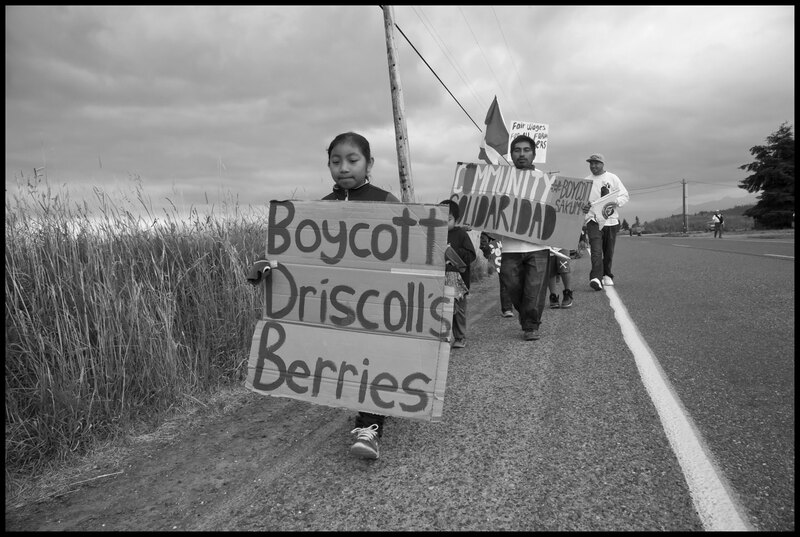 The union launched a boycott of Driscoll’s, saying the company was obligated to ensure that growers producing its berries respected labor rights, including the right of FUJ members to their jobs, and to negotiate a labor agreement. FUJ members and supporters began picketing Washington State supermarkets selling Sakuma berries under its own label, and also under Driscoll’s label. Nevertheless, Sakuma Brothers Farms, whose application for H-2A workers was defeated in 2014, did not make one for the 2015 season. Many FUJ members went to work, and when picking started so did protests. The company implemented a pay system requiring workers to pick 35 pounds of strawberries per hour to earn a $10 minimum wage ($2 below what they’d paid guest workers in 2013). At first workers negotiated a cut in the quota with owner Ryan Sakuma. When blueberry picking started at the beginning of July, however, the quota was raised. On its website, Sakuma says it pays a production bonus and a $10-an-hour guarantee. The website claims that pickers can earn up to $40 per hour. Workers say the quota changes every day. One recent pay scale puts the minimum at 40 pounds to earn $10 an hour. To make $40, a worker has to pick over 100 pounds each hour. Sakuma pickers walked out a third time on July 24. Then on August 8 a strike broke out at another company, Valley Pride Sales. Thirty-five workers left the fields and joined FUJ, asking for a 50¢ increase per box of blackberries. They complained there were often no bathrooms or drinking water in the field, and, according to Ramon Torres, they were told to use the restroom at a nearby gas station. After refusing to pick for at the company’s piece rate, strikers were told to leave its labor camp. Over the last several years, Mixtec and Triqui workers in California have also organized work stoppages. One strike by Mixtecos paralyzed Santa Maria strawberry growers in 1999. Four years ago a strike by Triquis hit the Salinas Valley pea harvest, after workers were fired for not meeting high production demands. “Their hands were swollen,” remembers Andres Cruz, a Triqui community organizer in the small town of Greenfield. “You use your nail to cut the pod from the stem, and the nail can’t handle it and sometimes pulls off. We organized that strike in one day.” Fired workers won reinstatement and a cut in the quota, but leaders were blacklisted the following season. While the absolute wage level differs substantially between Burlington and San Quintín, many demands made by workers are similar, and reflect similar conditions. 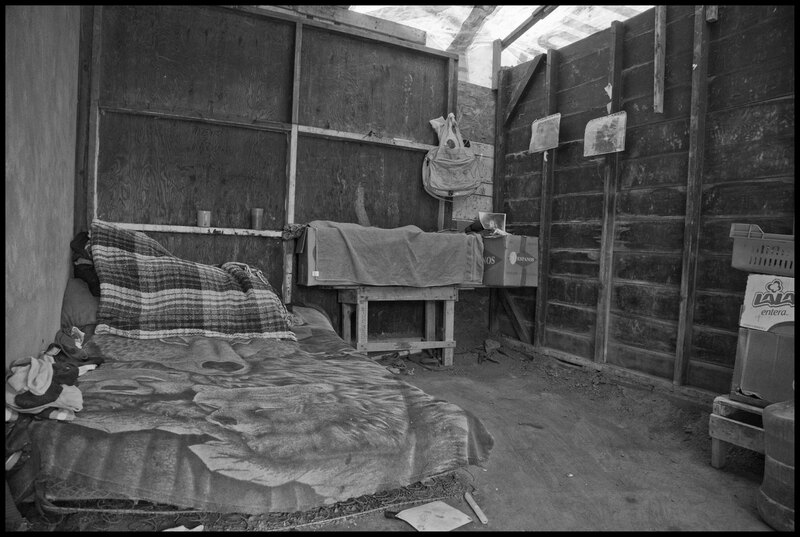 Piñeda said that when he arrived at the Sakuma labor camp in 2013 he was given mattresses so dilapidated that he had to wrap them in plastic, and had to cover the concrete floor in carpet samples. Another Sakuma striker, Rosario Ventura, said her cabin roof leaked. “They just stuffed bags in the holes and the water still came in. All my children’s clothes were wet,” she remembers. The pressure to produce on the piece rate is just as intense on the US side of the border. “You have to make ‘weight,’ they say,” recalled Ventura. “If you don’t they give you some days off, and if you still can’t make it, they fire you.” The pressure of no income in the off-season is the same. A large percentage of Sakuma workers live in Madera and Santa Maria, California. Their work in Washington State has to pay the cost of travel, and then tide families over during the winter. In San Quintín some workers at least qualify for IMSS-Oportunidades. 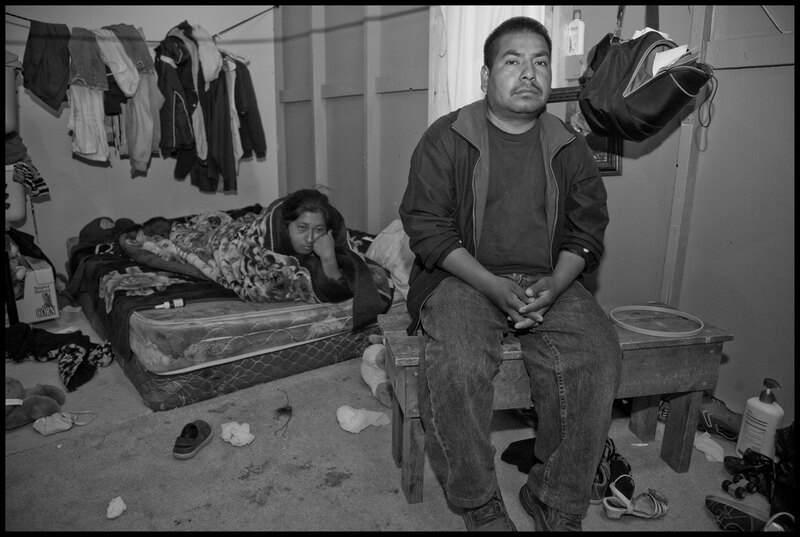 But in California the situation of Mixtec and Triqui workers is even more precarious because they are largely undocumented, disqualifying them from social benefits. Mixtec and Triqui farm workers in the United States and Mexico also share a common history of labor organizing. 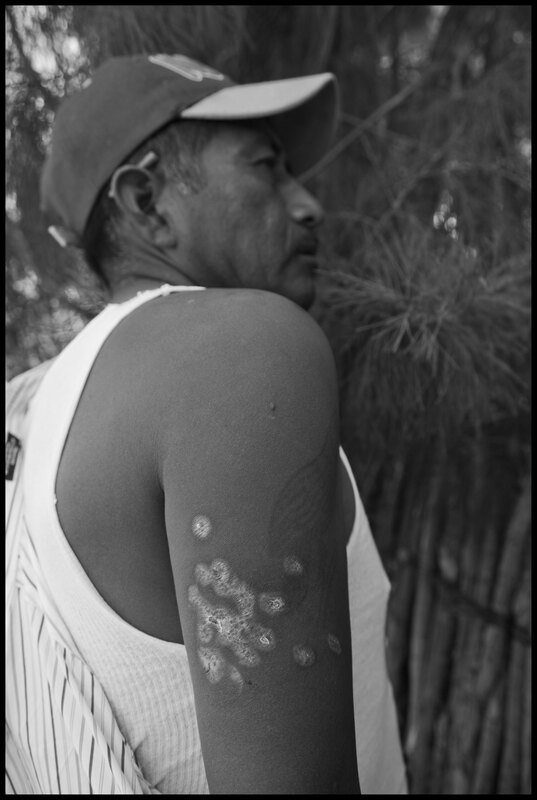 Many are veterans of three decades of strikes and land struggles in Baja California. 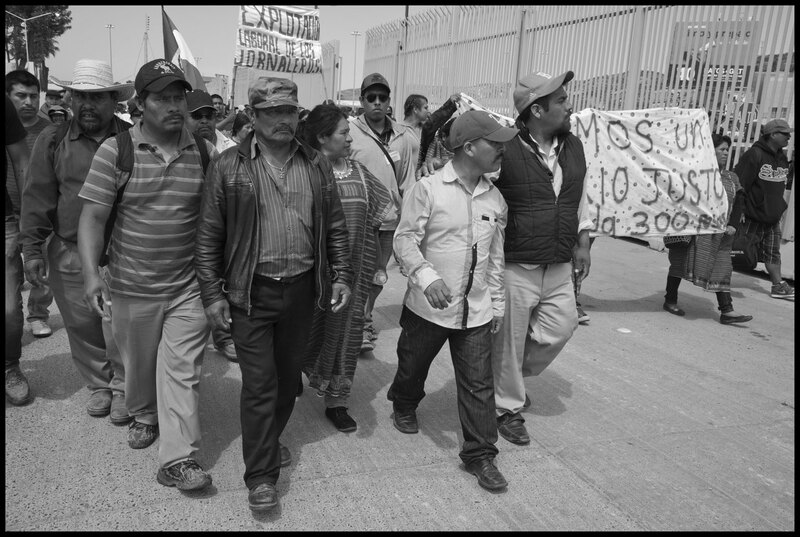 Indigenous leaders in both countries recall the first rebellions in San Quintín, led by the Independent Central of Farm Workers and Farmers (CIOAC). In the mid-1980s CIOAC sent organizers to northern Mexico to mount strikes. These were not always peaceful struggles. In one San Quintín strike a local packinghouse went up in flames. Later, as workers began trying to leave the valley’s labor camps and build permanent homes, CIOAC organized movements to take over land and force the government to provide water, electricity, and basic services. Two leaders, Beatriz Chavez and Julio Sandoval, were sent to federal prison for leading land invasions. One, Maclovio Rojas, was killed. “Our movement did not arise spontaneously in 2015,” Fidel Sánchez emphasized. “We have roots in CIOAC, and many of us came out of these earlier struggles.” Sánchez also worked for some years in the United States, where he participated in Florida’s Coalition of Immokalee Workers. Other Alianza leaders belonged to the UFW as migrants. “We’re trying to unearth knowledge of previous struggles, and incorporate them into the Alianza,” Sánchez explained. Another group with these roots is the Binational Front of Indigenous Organizations (FIOB), organized by activists who led farm worker strikes in Baja California and northern Mexico in the 1980s. Its first members were migrants in California, but later it organized chapters in Oaxaca and Baja California. Today FIOB has members in almost every town along the highway in the San Quintín Valley. 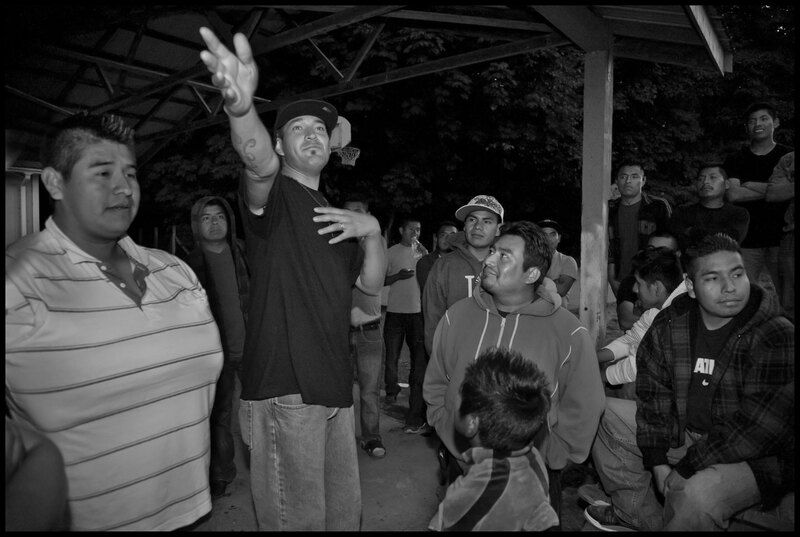 They were active in the strike, and one, Faustino Hernandez, was shot by police in Camalu during the events of May 9. This spring local chapters began holding workshops teaching the basics of organizing. FIOB chapters in California raised thousands of dollars for the strikers, and a caravan of activists from Los Angeles brought down three tons of food. FIOB met with BerryMex and Driscoll’s management, after organizing a picket line with other community groups at company offices in Oxnard. Garland Reiter said their accusations against BerryMex were untrue, and then hosted a delegation of outside observers to inspect conditions in its San Quintín fields and labor camp. Two observers later issued a report generally praising them. The Alianza, FUJ, and FIOB all charge that migration and low wages impose instability on workers. FIOB calls for the right to not migrate, or the right to stay home—for jobs, education, and economic development in home communities that would make migration a voluntary choice, rather than a necessity for survival.